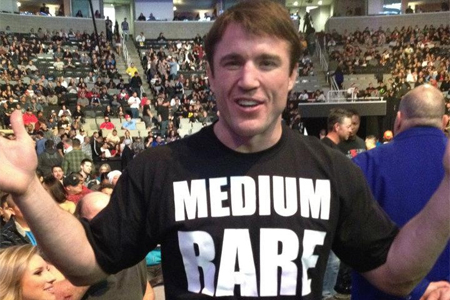 The Olympic flame might be ending its four-summer hiatus in a few weeks, but Chael Sonnen (Pictured) claims this year’s games can’t hold a candle to UFC 148. The chatty challenger rematches middleweight king Anderson Silva in the show’s featured attraction. “This is the biggest sporting event of the summer, and for a reason,” Sonnen professed during Monday’s conference call. “I heard somebody else say, ‘Well, what about the Olympic games?’ I’m scratching my head. I love the Olympic games, but let’s be fair. Just because somebody has got the Olympics on in the background while their family is eating dinner isn’t exactly the same. After manhandling Silva for nearly five complete rounds at UFC 117, Sonnen was abruptly submitted with only 110 ticks remaining on the clock. Since the August 2010 defeat, Sonnen has done everything within his power to land a rematch – including insulting every Brazilian fighter within earshot. Courtesy of Sonnen’s constant banter, and Silva’s verbal assault on Monday, the shootout will signify the most anticipated sequel in mixed martial arts history. UFC 148 takes place July 7th inside MGM Grand Garden Arena in Las Vegas, Nevada. The 185-pounders headline the pay-per-view broadcast. The Olympics, meanwhile, airs for free on NBC.